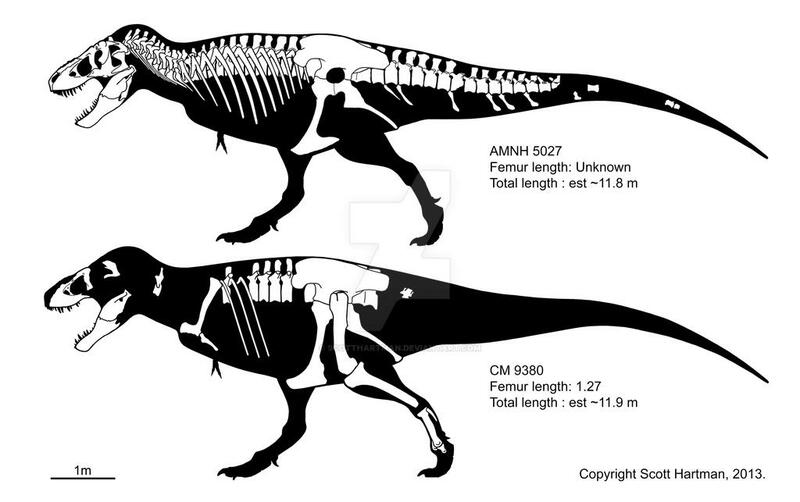 I mentioned awhile back that I was overhauling my specimen-based T. rex comparison chart (and perhaps adding to it). This is a quick update showing the differences between the type specimen (CM 9380) and the famous New York specimen (AMNH 5027). 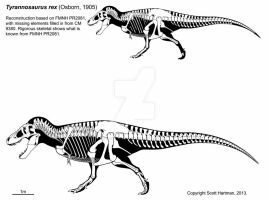 These were the first two specimens (of any completeness) ever found, and because they are fairly similar in size they have been combined to create the traditional T. rex mounts you see in many museums world wide. This could easily be chalked up to individual variation (compare your average NBA player with Jay Leno and you see far greater diversity), but it does emphasize the importance of looking at individual specimens in a species, rather than assuming you can mix and match them at will. P.S. I know many of you care about size estimates. Hopefully it's clear that we have no way of knowing which of the two specimens was actually larger, given how much is missing. I gave a very slightly longer estimate to the CM specimen because that's what I come up with, but that's assuming a tail that is similar in proportion as the AMNH specimen, and as we just discussed that's not necessarily a safe assumption. Do we have a full maxilla Length for CM 9380? if the tail on CM 9380 was more similar to that of sues how long would the total length be? ribs in AMNH 5027 is more rubust than Sue or this issue just related to our art skill? That is how they are portrayed in the AMNH monograph. I agree it seems odd, but I haven't been back to the AMNH since I did the skeletal. 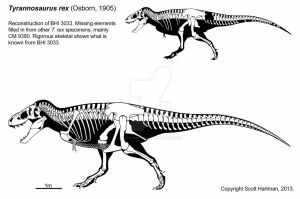 But maybe if it turns out that there really are two morphs of T. rex one will have robust ribs (or maybe Osborn just got carried away). Wonderful! Thank you for share us these beautiful scientific art! 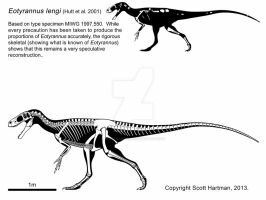 I do realize why Paulian-style lumping such as Velociraptor= Deinonychus or Apatosaurus=Barosaurus=Amphicoelias make little sense, but what about things like Velociraptor=Tsaagan or Tyrannosaurus=Tarbosaurus? They seem to have less variation between the genus than things like Panthera onca/tigris, which are in the same genus, and two very similar genus being lumped into one has happened before; Megapnosaurus=Coelopysis, IIRC. That's a fine question, but one without a satisfying answer I'm afraid. 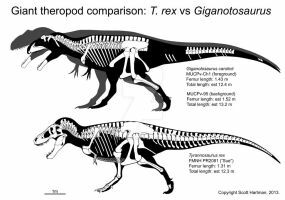 So as a past supporter of Tyrannosaurus bataar here's the reality I finally came around to: there is no consistency in terms of lumping vs splitting of extant genera, so it probably makes little sense to try and pretend we are capturing some vital information signal by arguing over what is and is not a fossil genera. Heck, we're almost certainly making mistakes at the species level in some cases, either because key components are not testable (e.g. some extant species have almost indistinguishable skeletons, while others have a lot of morphological variety) or because we don't even have a properly formulated concept of how to apply it to the fossil record (what does the biological species concept EVEN MEAN once significant time is applied - does it mean that if you take an animal in a time machine backward or forward by 3 million years and they still mated that they're the same species? That's not even hypothetically testable!). So given all that it's probably best to recognize that genera are just containers we made up that don't reflect an actual natural item. As such, I've switched to being in favor of splitting fossil taxa into more genera, because makes it harder to hide diversity when doing phylogenetic analyses (e.g. 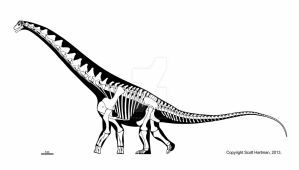 how long did Apatosaurus louisae stand in for all Apatosaurus and Brontosaurus specimens, because it had the best known skeleton?). 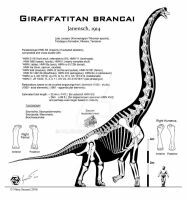 For people who really do like debating generic-level taxonomy and fossils there may be a new hope - the methodology used in the Apatosaurus/Brontosaurus paper of measuring how many character differences there are between genera in order to make the splits represent character diversity is an interesting concept to pursue. Of course characters are also somewhat arbitrarily selected, and in some groups they have a strong taphonomic bias, but it does point a possible path towards a future where fossil genera represent some actual indicator of evolutionary difference. Until then I'm content to work on everything _except_ these sorts of debates, which I leave to those really interested in them. Very interesting and unexpected answer! I was partially sure you'd say that it's unreasonable to consider two species that actual paleontologists note as different to be the same or the opposite, but just how uncertain we are about the consistency of fossil genera surprised me. Well, at least until the Brontosaurus method is applied to every dubious genus/species, if that ever happens. I've heard rumors of the "Sampson" specimen being possibly taller than Sue, yet still not as long. I'm currently sceptical about the accuracy of those claims. Do you have any thoughts or measuments on Sampson, or any future plans of drawing the specimen? The mount does look very tall, it's legs look huge when compared to the full body length and skull size. You can see it just by eyeballing a photograph of the specimen, but it can be missleading since the pose of the legs it's very upright and I don't know how much of the leg belongs to the specimen. That mount is tall because the knee is hyperextended, making the leg taller than it could have been in life. this may intrist you then. That looks pretty spot on to me. I've got nothing on Sampson, outside of some marketing photographs that were sent out years ago. But without knowing which bones are real and which ones have been reconstructed it's pretty much a crapshoot right now. Well, that's unfortunate. It seems to be a very excellent find, yet there's also no information on the specimen anywhere. It's very unfortunate - I hate knowing there is data available that isn't currently accessible. Hopefully that changes soon! And this is Why I don' t trust an isometrical 8% Giganotosaurus larger than the holotype or a gigantic Spinosaurus based on Dal Sasso specimen (I saw than rostrum many time) or a oversized (and frammentary) T.rex. 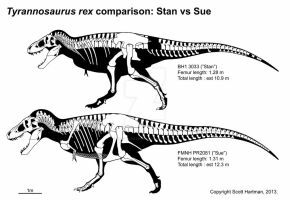 Are you going to make full skeletal reconstructions like you did with Stan and Sue? Or are you just going to leave at as it is? BTW, I don't advise anyone (myself included) to make a "rigorous" skeletal without first product a fully restored version. It's too easy to make basic errors in where the bones go otherwise. I already made them. Whether I post all of them is another issue. Is it true that you get a free cast of AMNH 5027's skull when you apply for a museum license? Are there any weight estimates ?? Not by me. I might do a double integration on them at some point, but I don't have the time right now, sorry. Hi Scott! These guys have a little bit different pose unlike a couple of your previous T-rexes. I mean the body angle. What way is more correct for you? The backs and tails are actually at the same angle, but the CM version has a somewhat shallower stomach leading up to a less-deep chest, since the pectoral girdle is proportionately smaller than it is on Sue. So that's a bit of an optical illusion. 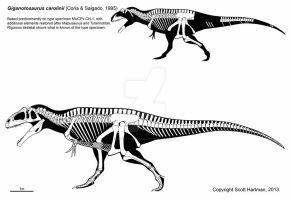 A good question though is whether those specimens missing pectoral girdles should go with the Sue or CM 9380 model. Perhaps after I get done restoring MOR 555 and reworking Pecks Rex I'll have a better handle on that question. Would basing the tail of CM 9380 on a specimen such as Stan or even Sue not be more sensible? Of the specimens you have restored, AMNH 5027 seems to have an abnormally long tail. Plus CM 9380 and Sue have both been referred to the 'robust' morphotype. A bit of speculation here. Could the answer to this high amount of individual variation _and_ the answer to why we have no adult specimens assigned to Nanotyrannus be staring us right in the face? The tail is actually about 2% shorter in absolute terms (maybe 3-4% shorter in relative terms) than the AMNH specimen, I just didn't bother adding that in since I try to find the line at which sharing all the minutia becomes more obnoxious than helpful. Still, you bring up a good question, and without more specimens I'm really not sure. 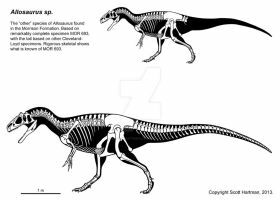 The hips don't even appear to be the main big difference here, anyone notice how the dorsal neural spines and the ribs are so much slimmer in the CM specimen even though the hips are more robust? Also the different in jaw curvature and skull shape is pretty telling. Clearly both are Tyrannosaurus, but I suspect that the AMNH specimen may be a different species OR at least a unique subspecies of T. rex. There do appear to be at least three subspecies in the current population of T. rex fossils, maybe more. Unless it's just a population changing over time...especially since we don't have good stratigraphic constraints on the classic specimens. Good point... though we also have to compare the Sue/Wankel morphs with the Samson/Stan/Peck's rex morphs when it comes to stratigraphy. That's sort of the point - is there really a Sue/Wankel vs Samson/Pecks/Stan dichotomy, or is it just part of a continuum? And if there is a dichotomy does it represent ontogeny, geographic variation, evolution over time, or sexual dimorphism? None of these things can be answer without more data and statistical analysis. Good point... and maybe some of these specimens don't even have the skull properly reconstructed, sort of like the debate over MOR 008. The restored snout tip on Wankel isn't even filled in properly in museum casts, it looks like there's a "dilopho-notch" in front of the maxilla. Jury's out, but there may be one research team that could clear up all of this mess within a short time, had they only the will. Maybe Jack Horner and his associates can turn some of their focus to running analytics on all the big T. rex specimens known, and their location and stratigraphy, to see what populations all of his MOR T. rexes come from. After all he has apparently more T. rex material at hand than anyone else, and after several decades of study on T. rex, probably has extensive data on the rest. A tragedy that the man with the best means lacks the proper scientific motive. It's a bit odd that the Horner/Scannella team haven't done much statistical analysis in this regard despite trying to move mountains to prove that Nanotyrannus is a juvenile T. rex. If I were in their shoes I'd first try to find out if "T.rex" is really one continuous species/population, before trying to lump other animals in there. Can anyone say, can't find the forest for the tree stumps? Namely trying to prove that cedar stumps are actually immature sequoias AND/or redwoods? You gotta love how Horner implicitly blasts his critics as "better suited for politics than paleontology" yet his debating points and "final-word" interpretation of evidence have all the premeditated polemic, predictable foregone conclusions and truth-monopoly rhetoric of a Stalinist show trial. The REST of the world needs the "paradigm shift". Jane HAD to be a Nano specimen and thus Nano HAD to be a juvenile T.rex, yet we don't even know if T. rex is one species, or two, or three - yet now we are throwing whole other genera in there, confusing young T. rexes with barely a hint of their parents' binocular vision for morphologically mature stereoscopic adults of a smaller genus. And yet he claims he doesn't even like T .rex and would love to do something else but "can't help finding it" despite the rarity of big predators - obsession in denial says I. He can't resist T. rex, it's his personal cocaine. What he really would cringe at - what he NEVER dares to touch or even talk about - are "international" taxa that are so overlumped as to make the very concept of lumping seem idiotic. Sit Horner down in a room full of Bothriospondylus, Ornithopsis, Titanosaurus, or Cetiosaurus - heck, even Allosaurus "europaeus" and "tendaguriensis", and then we'll see just how comfortable ideological lumpery makes him. I would only point out that Triceratops specimens far outnumber T. rex (for the obvious reasons) so it's not entirely illogical to start with that taxa. Good point... Triceratops is a bit complex because of all the different morphs out there but overall the pattern appears to be reabsorption and forward-curving of the horns with increased age, as well as a proportionally shorter frill in the very old adults - something that goes in a very un-Torosaurus-like direction. The straight/slightly double curved horn shape of most Torosaurus skulls is far more like adolescent Triceratops than old adult Triceratops... in fact most of the Torosaurus skulls seem to be immature animals. Shockingly the huge MOR Torosaurus skull appears to have more clearly defined epoccipitals than some smaller skulls, as well as smaller fenestrae in the frill. It may actually be less mature than some smaller Torosaurus, as well as having a thick boss in place of a nasal horn - which presents a bizarre possibility - we could have a new species, a hypothetical "Torosaurus magnus" in addition to plain old Torosaurus latus. As rare as Torosaurus is though, the sampling to prove or disprove this will have the same problems as trying to define populations within T. rex, but to an even worse degree. Triceratops clearly does have a lot more data to work with. awesome skeletals! no such thing as too many t. rexes! I wager CM had a platypus tail. It certainly could be, but it's hard to establish that for sure, since our sample size is too small and it's not from a single population (e.g. they are from different places and different times, and could potentially be from different species). Without being able to control for those things it's hard to tease apart the main causes of the variation we see.